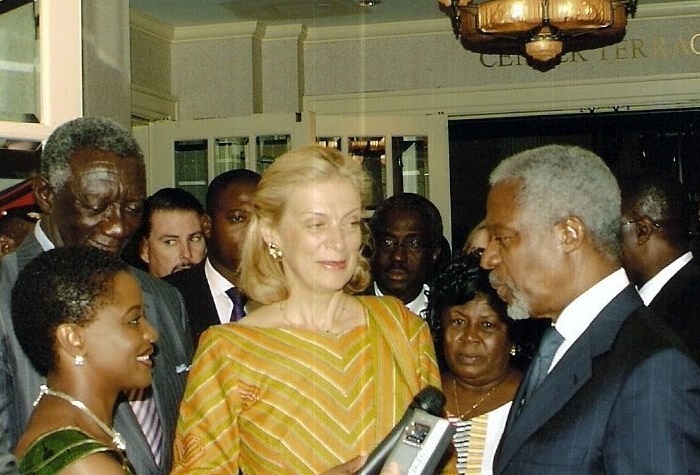 In December 2006, on the eve of Kofi Annan stepping down as the seventh Secretary General – a tenure he served for 9 years from 1997 to 2006 – I was a journalist working in New York, assigned to cover the farewell reception hosted in his honor by the Ghanian Mission to the UN. While making his entrance to the reception with his wife Nane, and flanked by the then Ghanian President John Kufuor and other diplomats, I somehow managed to corner the guarded group. I introduced myself and suggested how wonderful it would be, if he spoke directly to his fellow Africans through our platform. He graciously obliged to a few questions. During our brief chat, he spoke proudly about being an African, fondly of his home country Ghana, was not quite sure what to expect with retirement, and concluded with the importance of our legacy as human beings. I also recall his wife Nane expressing her pleasure at now being able to have her husband home more often. During his lifetime, this Ghanaian diplomat held many administrative positions that saw a steady rise in his career. He was a practicing peace ambassador, as demonstrated in his approach, policies and personality hence winning the Nobel Peace price in 2001. Peace was a quality Kofi Annan was often criticized for by many who readily welcomed other options to peace, in the most tumultuous of times that witnessed the highest increase in peacekeeping missions around the world. He was a proud African, who not only represented the continent as the first black African to hold one of the highest offices in the world, he led it with grace and a quiet resolve that influenced the world’s perspective of the African people and continent. How else could he depart but ‘peacefully in his sleep’? Rest in the PEACE you brought in no small measure, to a world that remains troubled.